Rains mean fresh corn. Yellow or white they are both very tender, milky and taste very nice during the rainy season. Roasted, boiled or in a curry form. Call it anything you like, corn, maize, sweetcorn, makai, bhuta. Corn is rich in carbohydrates,dietary fibres, thiamin and folates. Low in sodium and saturated fat.I love this shaak or curry or vegetable. Its a ‘keep your guests busy’ curry. Use any corn you prefer, white or yellow. The gravy is thickened by the coarse peanut powder. I love adding coconut milk or coconut cream as opposed to fresh cream. Cut each corn into 6 to 7 pieces. So from two corns you will get 12 to 14 pieces depending on the size of the corn. Wash the corn and put it in the pressure cooker. Add the 3 cups of water and salt and pressure cook it for 2 to 3 whistles over medium heat. When done, remove it from the water and keep the corn on the side. At this stage you can remove the kernel of 3 to 4 pieces if you like. To prepare the gravy, heat oil in a deep pan. When it is slightly hot, add the cloves, cinnamon and peppercorns. When they splutter, add the onions and stir fry till they are light pink in colour. Add garlic, chilli and ginger paste. Stir fry for a few seconds. Add the coarse peanut powder. Stir fry it till it turns light brown. Add turmeric, chilli, and coriander cumin powder. Mix well. Add the tomato puree and cook it for 2 to 3 minutes. Add salt, sugar and 2 cups of water. Add the corn. Mix well and let it simmer over medium heat till the gravy thickens a bit. Add the cream or coconut milk just before serving. Garnish with chopped coriander and serve with hot chapatis, parathas, puri or rice. I usually roast the peanuts at 150°C in the oven till the skin comes off when rubbed in between the finger and thumb. I store these roasted and shelled peanuts to use in shaaks, salads, cookies etc. If you do not want to use fresh cream or coconut milk, just increase the tomato puree to 2 cups. 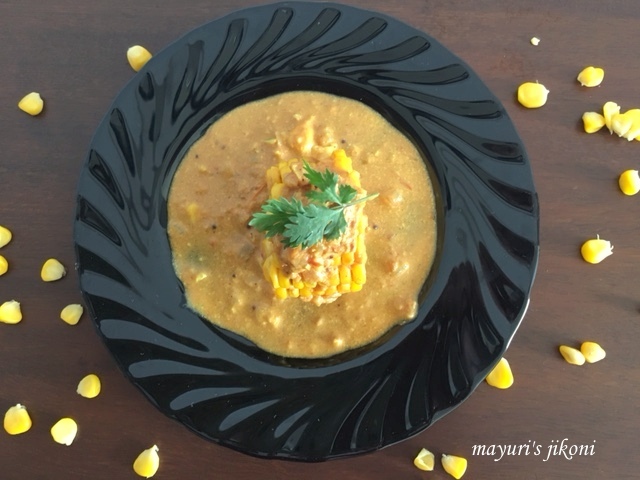 If you are making this curry for young kids then remove the kernels form the cob. Can use cashew nuts instead of peanuts. Check out the recipe of Nunu’s biryani for the coriander cumin powder or buy ready made from the shops. Use tender white corn instead of the sweet corn.